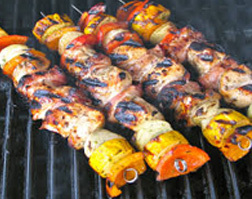 Delicious, mouth-watering Appetizers and Cocktail Party Catering Services. Casual to Elegant Appetizers for Receptions. 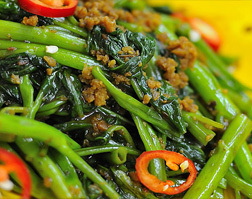 Affordable to Elegant Buffets with your choice of Entrees, Vegetables, Salads, with optional Delivery & Set-up. Shower and Theme Buffets. We'll build a menu that will excite your Bridal and Baby Shower guests. The best contract food services in Michigan. Box Lunches, Breakfasts, Simple to Elaborate Contract Feeding. 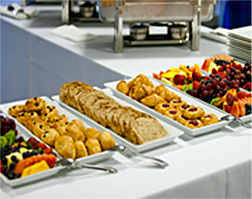 Breakfast, Elegant Brunch, Deli Buffet, Box Lunches, Theme Buffets, Open House, All Day Meetings. 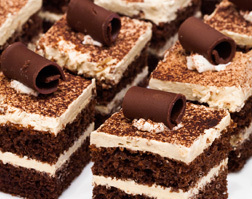 Signature Desserts are the perfect finale to a memorable meal. Experience Gary's Catering Grand Dessert Extravaganza. 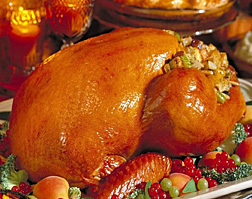 Casual to Upscale Thanksgiving, Christmas & New Year's Eve Party catering. Home, Office and Corporate Menu Ideas. State of the Art Catering Trucks & Services. Daily Mobile food services at your doorstep. Serving 75-100 in minutes. Casual, Elegant & Theme BBQ Buffets. Prepared fresh over an open flame. Vegetarian entrees available. 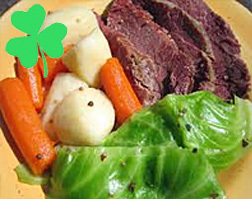 Oktoberfest German style buffet, St. Patrick's Day Party cuisine. Graduation and Independence Day Parties. Extraordinary Wedding Menus at affordable prices. 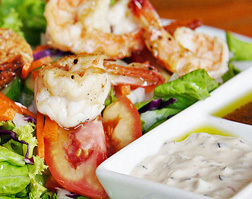 Wide variety of memorable entrees, desserts and beverages. 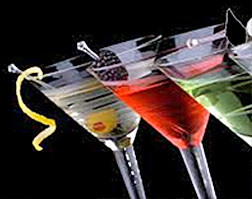 Beverage stations, standard to premium bar services, wide variety of mixes & garnishes, bartenders, coffee and punch stations. 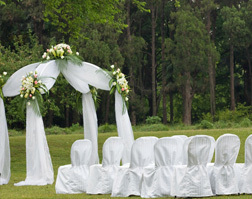 Tables, chairs & covers, silverware, linen, glassware, tents, lighting, dance floors, cooling units, portable restrooms, bounce houses. Gary's Catering works with a wide array of catering venues, reception halls, and banquet centers in Southeastern Michigan for parties, events and weddings. Thank you for your interest in our full service catering services. 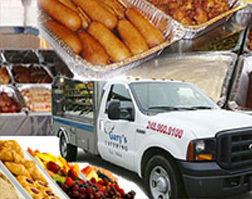 Gary's Catering has carried on a tradition of culinary excellence and superlative service in Southeast Michigan and the Metro Detroit, MI area for over forty-five years. We provide catering services in Michigan and Ohio for clients who demand the best in food and customer service no matter the location! Breakfast, Lunch or Dinner. Private, in-home, indoors, outdoors, corporate, office, or reception settings. Among enticing appetizer buffets, delicious and affordable dinner & lunch buffets and delectable dessert tables, you'll discover an impressive variety of offerings to perfectly suite your event needs. 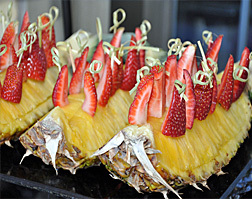 Chef Joseph Less utilizes only the freshest, finest ingredients in his food creations. 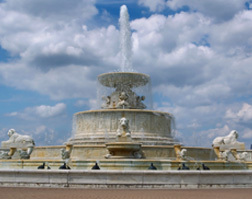 Gary's Catering is proud to help support our Michigan economy by featuring Michigan based ingredients whenever possible. 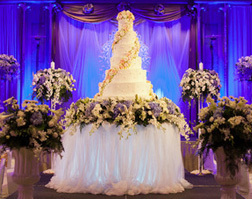 Please let us know how we can assist you in creating a very memorable event for all those fortunate enough to attend. Upon review of our gourmet or casual food offerings, we invite you to visit our facility and speak with our local event planners. At that time, we can discuss your event or party in greater detail and give you the opportunity to browse through our beautifully arranged color portfolio, review our stellar references, and provide a written proposal for you. We're the Michigan caterer that can transform your event location into a "Showplace", with our professional and courteous staff handling all necessary arrangements to ensure that you and your guests will enjoy the festivities in a carefree setting, dining on fine cuisine. Corporate clients, please contact our office to arrange a suitable time for Chef Less to visit your office or facility to explore all Gary's Catering can offer your company for your corporate parties and events. Options include: food and beverage service, bartending, equipment rental, dj service, live bands/music, photography, printing, and transportation services. West Bloomfield, Michigan, Catering Services, Bloomfield Hills, MI Catering, Wixom, Novi, MI Catering, Livonia, Canton, MI, Westland, Wayne Party Catering, Detroit, Dearborn, MI Catering Service, Dearborn Heights, Michigan, Wyandotte, Auburn Hills, MI, Troy Caterers, South Lyon, Milford, Plymouth, Michigan Caterers, Northville, MI, Ypsilanti, Redford, Farmington Hills Catering Services, Canton, Commerce, Royal Oak, Michigan, Birmingham,, MI, Farmington, Michigan, Ann Arbor, MI Catering Services, Dexter, Pinckney, Brighton, Howell, Hartland, Fenton, MI, Food Catering Services, Flint, Southfield, MI Catering, Belleville, Rochester Party Catering, Michigan, Ferndale, Rochester Hills, Bloomfield Hills, Michigan, Clarkston Caterers, Waterford, Bingham Farms, MI, Taylor, Saline, Brighton, Lapeer, MI, Sterling Heights Caterers, Warren, St. Clair Shores, MI, Eastpointe, Harper Woods Off-Site Caterer, Grosse Pointe, Grosse Pointe Farms, Roseville, Clinton Township Catering Services, Shelby Township, MI, Beverly Hills, Trenton,MI Catering Service, Downriver, Jackson, Lansing, Michigan, Metro Detroit, Oakland County, MI Catering Services, Wayne, Macomb, Livingston Catering Services, Washtenaw, Genesee, St. Clair, and Ingham County. 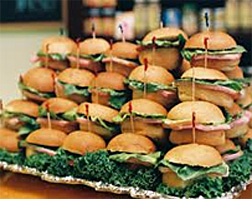 Party Catering Companies in Metro Detroit, Michigan.